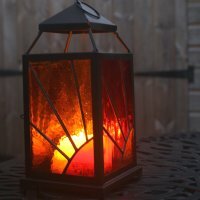 Would you like to learn a new art skill? 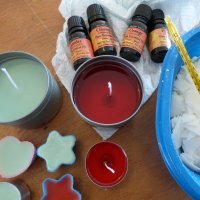 Discover your creative side? 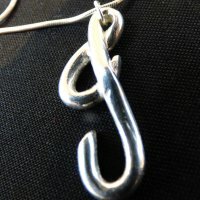 Approach your existing artistic activities from a new direction? 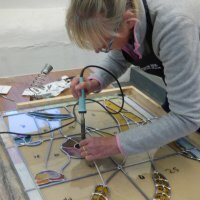 At Vitreus Art we work with some great artist teachers - all respected in their fields and passionate about sharing what they do. 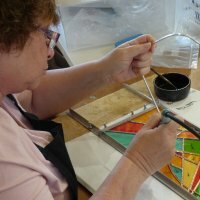 As well as our own stained glass and glass fusing classes, there's a range of one-day classes and courses over several weeks. Our ethos has always been to hold fun, creative and friendly classes and to include materials and equipment in the cost, wherever possible. 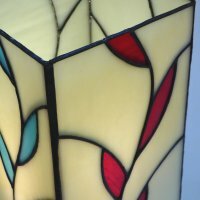 Read more about each type of art on its own dedicated website page. 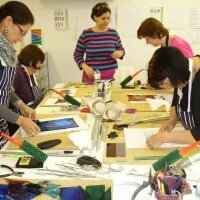 Perhaps you've always wanted to learn to paint and draw, or would like to learn how to make print-work without a heavy and expensive press? 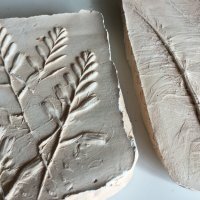 Find out more about Clare Tebboth's 'printing without a press' classes - covering a range of techniques, suitable for beginners. 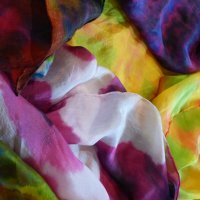 Clare Tebboth also runs Mixed Media Madness 1-day classes for everyone interested in discovering how to take painting to another level. 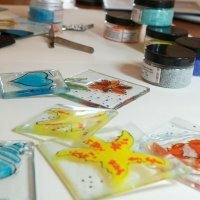 Or you can design and make your own Fused Glass or PMC (Precious Metal Clay Jewellery. We'll always be happy to answer your questions, or chat to you at our studio. 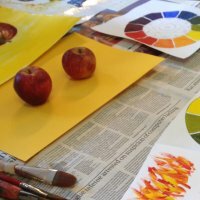 Did you know - you can buy a Gift Voucher for class, or to spend in our gallery on art work? Visit this page for detaIls! You can download a PDF list of all current class dates here.